In the biblical parable of the talents (Mathew 25:14-30), a wealthy man entrusted his property to three servants and gave to one of them five talents (or coins), another two, and another just one based on their individual abilities. He then went away, leaving the servants in charge. The servant with the five talents traded them and earned five more talents. The servant with two did likewise. But the servant who was given only one, buried his. When the master found out how the one given five and the one given two had doubled their wealth, he was pleased, but when he heard that the one with only one talent hid his, he asked for that servant to dig up his coin and give it to the servant who now had ten, and then the master cast the poorest soul into the outer darkness. In my early years, I sympathized with the poor man who was given only one coin, and held onto it. It seemed the judicious thing to do, as I too was poor and understood the fear of risking the loss of that which had been given to you without assurance of a profit. It took years for me to come to grips with this biblical conundrum, but I did get the idea of buried talents. Throughout my early teen years, I struggled from what would now be called ADHD or Attention-Deficit/Hyperactivity Disorder. Though I seemed bright enough, I struggled to remember details of what I studied, like the names of the bones in the body, my vocabulary words, or the names of just about anything and anyone. As many have done, I worked through it and compensated for my disorder. But, it also meant failing tests and getting poor grades, no matter how hard I studied. Part of my compensatory skills was redirecting my abilities to directions where I could succeed. I was a creative writer, so I could create interesting stories for projects in English class that earned me rewards. Sometimes, the projects only brought a "D: grade to a "C" grade, but I got by. I also had fairly impressive "spacial relations" skills, which meant I could "replicate" photographs into drawing or paintings far beyond the skill sets of other children in my class. I was also tenacious, and could stick with an "art" project as long as necessary to make it appear impressive. 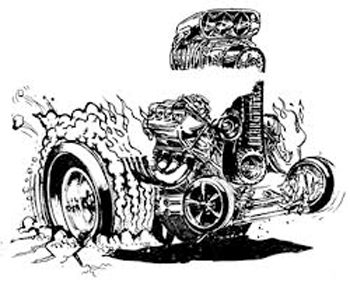 In high school, I copied the style of the monsters in cars conceived by the genius custom car creator Ed Roth. Near that time, I began designing my own custom cars in pencil on paper. I also painted the "Ed Roth Style" characters on the deck lids, dashboards and door of my friends' cars for small fees, personalized my '52 Plymouth Sedan with the drawings of Charles Schultz Peanuts characters, and added a signature drawing on my purchased cards at Christmas of Carmichael, a character from a 50s and 60s cartoon strip. Since my high school grades were less than stellar, and neither my parents nor I had much money, if any, for a college tuition, on the basis of a suggestion of my uncle, I settled on Temple Technical Institute, a subset of Temple University, and a school that taught the technical trades. I really didn't give the process much thought, in fact hardly any. I showed up on the day of registration and discovered that I had to select an area of study. My mother always thought I could be an architect because of my skill at drawing and building models of houses. I, however, was enthralled with the cars, mostly hot rods and custom cars. So, the day that I signed up for courses, I selected "Mechanical Engineering Technology" as my major. I must explain at this point, that I had never been accomplished at math or science, and the choice of Mechanical Engineering Technology was made with the hope of finding my way into the automotive design field. This was in the fall of 1965, and the tuition was small for the semester, but even at that used up the better part of my mother's savings. Temple had just become a "state school," and the course was a three year program leading to an Associates Degree. I lived at home in the 69th Street area of Upper Darby, and could take two trains (elevated/subway lines) to Temple in North Philadelphia. I did sort of know the first day I arrived that I had made a careless choice, but I had no hopes or dreams, and no real pathway to any future. So any choice was better then no choice, and I began attending classes. We did have a guidance counselor at the school, and he asked if any of us might need financial aid. I said, "I do... ," then applied... and got a full scholarship from the State of Pennsylvania. I also signed up for the co-op program that would help get me a job after every two semesters and allow me to work in my field. I had never had a real job, and it would pay enough that I could pay my mother rent and my expenses while attending. It was during the first semester that I started to think about my life. Through two courses unrelated to engineering, i.e. literature and semantics, a began to gain an interest in words, ideas and the meaning of life. I enjoyed one F.Scott Fitzgerald story immensely, May Day, and read Flaubert's Madame Bovary and Hemingway's The Sun Also Rises. In my semantics class had my first glimpses of philosophy along with the connotation behind words. My lack of interest and ability in chemistry, physics, thermodynamics and mathematics became more apparent as I continued in my classes and in my co-op jobs. I actually thought I would like my first job working in a factory that designed and manufactured sealing rings for submarine propeller shafts. My lack of interest and skill was legendary, and I was reduced to filing catalogs and inscribing numbers on carbon seals. My next job was as an engineering clerk for United Engineers, folding and delivering prints from the print room to the draftsmen. In my third job, my main task was testing valves under pressure to determine leakage. By the end of my second year at Temple Tech, I knew that I had made a terrible mistake, and I decided that I would ask to take a leave of absence...to find myself. I must insinuate here that I also was not happy in a relationship I was having, and looking for a way to escape everything...my school, my girlfriend, my parents, and myself. Fortunately for me, I found the correct person to console me. This was the Dean of Men of Temple Tech. I had made an appointment to plead my case, i.e., I was a poor boy who had picked a course that I didn't like, and I thought I should be given a chance to leave for a while to discover who I was and where I was going. When I got to the appointment, the Dean was ready for me. I don't believe I even sat down before he said, "You're a scholarship student aren't you, Mr. Rothacker?" I said, "Yes, but.."
At that point he slammed his fist on the desk next to which he was standing and began yelling at me, "You ungrateful little S.O.B., do you know how fortunate you are to be given this education?" I was shocked...and tried to start again with "But...," but before I could get anything out of my mouth, he continued," I promise you, if you even think of quitting now, or running off to find yourself, I'll personally make sure that you are never let any where near here again." Then there was silence, as he just stared at me and while his head swayed left and right indisgust. "Now get out of here!" he said quietly, "But think twice about leaving your responsibilities behind." At that he walked away, and I was left standing with several people looking at me from outside the office. "How could he be this way to me?" I thought as I was leaving. "None of this is my fault. I'm poor. I didn't have the opportunities to select a good school...or make a right decision." His voice had found its way into my head. Though I knew he had been unfair to me, I didn't leave the school. I remained with the program.....and for that I am supremely grateful. His words, though harsh to me at the time, were what I needed then to keep me grounded. In the book, Cat's Cradle, Kurt Vonnegut wrote of people who make a difference in one's life. His premise was that we meet many, many people in our lifetimes. Some remain close for many years and have no effect on us; others we may know briefly, but their impact may change the course of our lives. I have no recollection of the name of the Dean who spoke to me in 1967, but I do know that his influence helped guide me to a more responsible and meaningful life then I would have had without him.